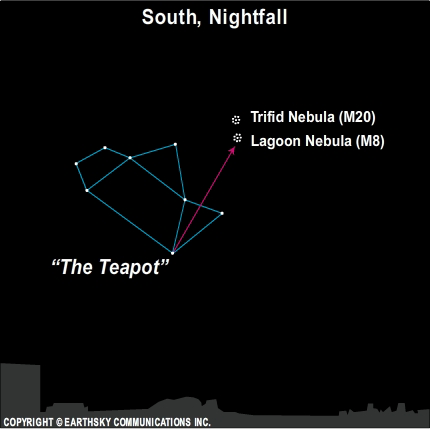 Take a dip in the Lagoon and Trifid nebulae on these September evenings. Before you head out the door after dark, be sure to grab your binoculars. Look in the south to southwest at nightfall and early evening to see the beautiful constellation Sagittarius just above the horizon. The famed Teapot asterism, part of Sagittarius, appears to be pouring tea from its spout towards the horizon. These nebulae are in this part of the sky. As you sweep around the area of the Teapot, you will be stopped at several fuzzies or blobs of stars. There are lots open clusters and star forming nebulae to look at in the region but we are on the hunt for two in particular. Now go to the spout of the Teapot. If you are in dark skies and can see the Milky Way streaming up from the horizon, you may notice a black area with two little fuzz balls in it that look like puffs of steam. Those that are in suburbs or cities, you may just notice a fuzzy star just above the spout. The fuzzy star or fuzz balls are the Lagoon and Trifid nebulae or Messier Objects 8 and 20. You are seeing two star forming regions in the heart of our galaxy. The Trifid is a little dimmer than the Lagoon. Trifid got its name because in photographs it has three distinct lobes. The Lagoon got its moniker because it looks like a round pool just outside of the ocean of the Milky Way. What is really cool about the Lagoon is that you can see some of the stars that have formed from the clouds of gas you are seeing. You might not spot it in binoculars but those with small telescopes may notice a small cluster of stars within the nebula. This cluster is known as NGC 6530. By late autumn and winter, these nebulae will drift out of the evening sky, so be sure to take a dip in the Lagoon and Trifid nebulae on these moonless September evenings. Site contents copyright © 2019 Recorder Online	except as noted. All rights reserved. | 88 queries in 2.216 seconds.